We hope you'll enjoy this short video, in which Eckhart Tolle talks with Steve Taylor, author of The Calm Center: Reflections and Meditations for Spiritual Awakening, about being in the book writing flow. The Calm Center is an inaugural title in our new Eckhart Tolle Editions publishing imprint, featuring titles personally selected by Eckhart for publication.We also invite you to subscribe to New World Library's YouTube Channel for immediate access to the latest author interviews, book trailers, and more. We hope you'll enjoy this short video, in which meditation teacher Diana Lang, author of Opening to Meditation. talks about how to start a mediation practice. We also invite you to subscribe to New World Library's YouTube Channel for immediate access to the latest author interviews, book trailers, and more. We hope you'll enjoy this short video, in which Eckhart Tolle reads a poetic meditation from The Calm Center: Reflections and Meditations for Spiritual Awakening by Steve Taylor. 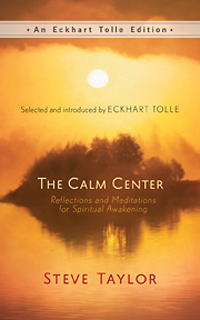 The Calm Center is an inaugural title in our new Eckhart Tolle Editions publishing imprint, featuring titles personally selected by Eckhart for publication. We also invite you to subscribe to New World Library's YouTube Channel for immediate access to the latest author interviews, book trailers, and more.